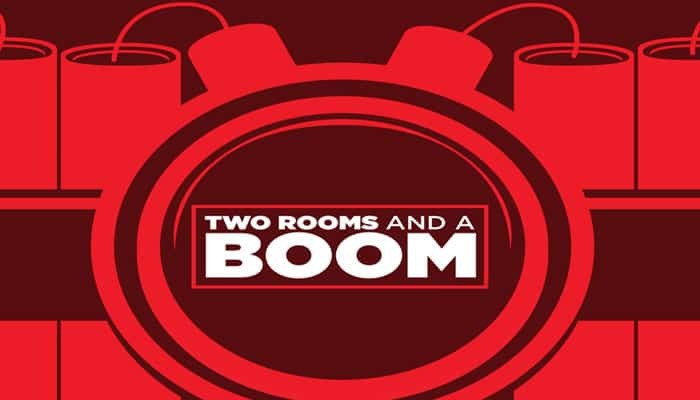 In Two Rooms and a Boom there are 2 teams and 2 rooms. The 2 teams are the Blue Team and the Red Team. The Blue Team has a President. The Red Team has a Bomber. Players are first equally distributed between 2 separate playing areas (usually 2 separate rooms) and then each player is randomly dealt a facedown character card. Players play the game by saying what they want in order to select a leader for their room. The leader chooses hostages (players who will be sent to the other room at the end of the round). The game consists of 3 timed rounds. Each round is shorter than the previous round. At the end of each round, the hostages selected by the leaders will be traded into opposing rooms. The game ends after the last hostage exchange. Everyone reveals their card. 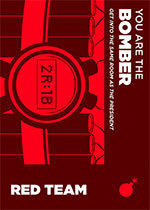 If Red Team's Bomber is in the same room as the President, then the Red Team wins. Otherwise the Blue Team wins. 1. Set Up The Character Deck. 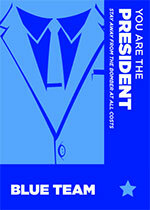 The character deck consists of the President card, the Bomber card, and an equal number of Blue Team and Red Team cards. There will be one character card for each player in the game. If you are playing with an odd number of players, include the Gambler card (see Gambler section on page 10). Shuffle the character deck. 2. Separate Players Into 2 Rooms. Players should be separated randomly and as evenly as possible. The "rooms" can be separated by a wall, door, or simply two open areas at a distance from each other. It is not important if players can see one another, but players in the separate rooms shouldn't be able to hear one another. Every player receives l facedown character card. The character cards are secret but can be revealed during the game. Players should not look at their own cards until the game begins. Now the game begins with the first round. The first round of the game lasts 3 minutes. The second round is 2 minutes, and the last round is 1 minute. Round time can be kept by anyone with a stopwatch. Time is never kept secret. The end of a round should be clear to all players. 2. Stay In Your Room. You can't just mosey into the other room whenever you feel like it. 3. No Communication Between Rooms. No yelling anything to players in the other room. No eavesdropping. Even if you can see into the other room, there is no sign language permitted. Do what you want with your character card. Show it to someone, everyone, or nobody. However, no swapping character cards with another player, and if you are going to show someone your card, you have to show all of it. You can't just show the color of your card. I guess there are more than 4 basic rules. While you can't count on us to count too well, you can count on us to explain more rules. 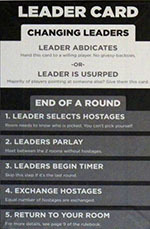 The leader is the player who holds the leader card and chooses the hostages to leave the room at the end of the round. Remember: Leaders can't be hostages. The first leader of a room is the player who is appointed by another player. 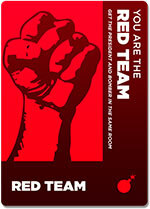 To appoint a player, point to them and say, "I appoint you as leader!" A player can never appoint themselves. The appointed leader then takes the leader card as a visual identifier. Leadership should never be a secret. The number of hostages a leader chooses at the end of a round depends on the round and the total number of players. The number of hostages is listed on the leader card and the chart below. Important: Before beginning the game, pay attention to how many players are in the game as this dictates how many hostages are exchanged at the end of each round. Want a different leader? Here are the 2 ways to do that! If you are leader and don't want to be (usually because you want to be a hostage), then simply hand the leader card to a willing player. The player may accept or refuse leadership, but if they do accept leadership, you can't become leader again until the next round. If there is still time in a round and you want a different leader, raise one hand into the air (so your usurping attempt is clearly visible) and point your other hand toward the player you want as the new leader. Note: you can point to yourself. 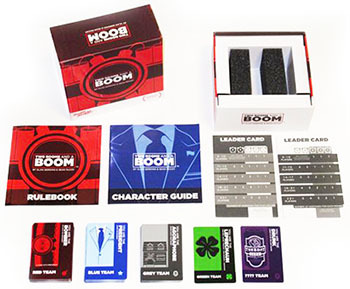 Once a majority of players in the room (more than half) are pointing to a single player, that player becomes the new leader and receives the leader card. Indicate your hostage selection to the players in your room. Players in your room need to know who was selected as hostages because you can t change your mind once hostages are selected and you can t choose yourself (for the number of hostages to send, see your leader card or page 7). Leaders parley by meeting between the 2 rooms without hostages. Leaders meet without their hostages so that if one room's leader is slow to select hostages they aren't influenced by seeing the other room's incoming hostages. Trust us, this is important. Leaders begin timers for the next round. If this is the last round (the 1 minute round), then skip this step. Exchange hostages by calling over your selected hostages. An equal number of hostages should be traded from each room into the other. If this was the last round, the game ends (see GAME OVER section on the next page). Return to your room if everything went smoothly. If not, you may need to reread this section. After the last hostage exchange, the game ends. Everyone reveals their cards (unless playing with the Gambler). 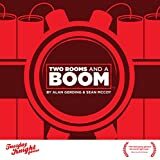 If the President is in the room with the Bomber, then the entire Red Team wins. 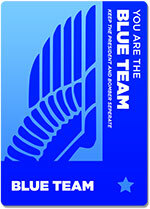 If the President is not in the room with the Bomber, then the entire Blue Team wins. When playing with an odd number of players, shuffle in the grey Gambler card with the other character cards. If you are the Gambler, pause the game by showing every' one your card after the last hostage exchange. This should be done before all other players reveal their cards. Don't worry, players should wait for you. This isn't a race. You must then verbally announce who you think is about to win the game (Blue Team or Red Team). You win if your prediction is correct, so don't worry about anything else. 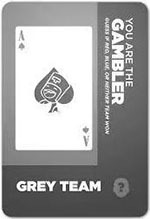 Remember: The Gambler is on the Grey Team and therefore has an individual win objective that is completely separate from all other players. The Gambler can win or lose and so can all other players. Once you get familiar enough with the Basic Game, try the Advanced Game with more rounds, characters, and 3 additional rules! If you have more than 10 players, players are no longer limited to revealing their entire card. Instead, players may choose to reveal only part of their card. You can play with advanced character cards that modify the basic rules of the game. If an advanced character card contradicts a basic game rule, then the advanced character s rule should be followed. Try adding a 5 minute round and a 4 minute round, but only if you have more than 10 players. If you don't have enough players, stick with 3 rounds (see your leader card).